Although Diepenbrock clearly did not think much to Heine’s poetry, he was to set three of his ballads to music. Dämmernd liegt der Sommerabend (In Twilight the Summer Evening Lies) dates from May 1884. He composed Der Abend kommt gezogen (The Evening Falls, RC 11) that same year and Es war ein alter König (There Was an Old King, RC 25) at the beginning of the summer of 1890. In Dämmernd liegt der Sommerabend Heine describes how dusk descends on woods and meadow, while a golden moon shines in the deep blue sky. Then he takes the reader to a stream where the crickets chirp and a wanderer to his surprise comes across a beautiful elf who is bathing herself. Her white arms and neck are illuminated by the moonshine. The ballad stops here; unlike in Goethe's Der Fischer (see RC 6) the encounter does not lead to the tragic death of the man who was overcome by the sight of a mermaid. 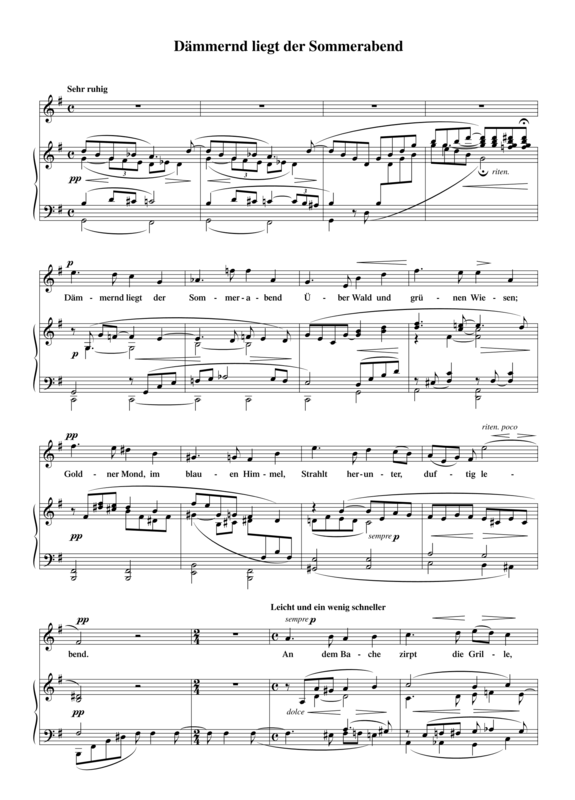 The text inspired Diepenbrock to compose a work with a lyrical vocal part, which often has large leaps, and a harmonically rich piano accompaniment. Diepenbrock wrote this song for his second cousin Christine Driessen in May 1884. Most likely her voice did not have the required range, because copy A-80(3), in which the song is transposed down a whole tone, was also made for her. On 12 August 1909 he notated a revised version of the song in a sketchbook. He added six measures, extending the song to 41 measures, and adapted the melody of the voice to the declamation of the text. The harmony of the piano part of this version is more refined. The song was not published during Diepenbrock’s lifetime. It will not have been sung outside the family; in any case, nothing is known about an official premiere.